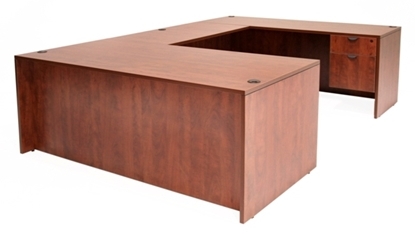 This large U shaped desk provides plenty of surface space and storage. The Legacy series from Regency is constructed of thermal-fused melamine laminate with a matching 3 mm PVC edge. Includes (1) box drawer and (1) file drawer. Perfect for an executive office or home. Free shipping and warranty available. A U-shaped desk that gives you an open feel with its peninsula front design. 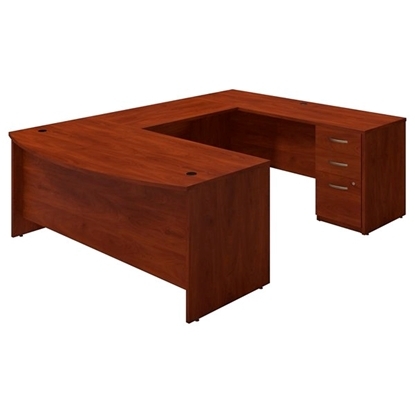 This desk offers plenty of work area, a 1 5/8" thick top, and is available in 4 colors. A desk designed to create a modern and refined work environment, this U-shaped desk features a stylish tow-toned color scheme and plenty of work space. This desk makes a great addition to any home office or commercial office and its storage credenza ensures you have plenty of storage. 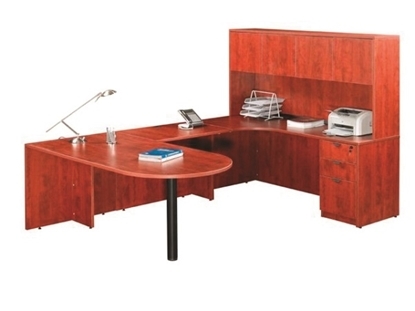 The Bestar Prestige U shaped desk with hutch provides durability, versatility and functionality. 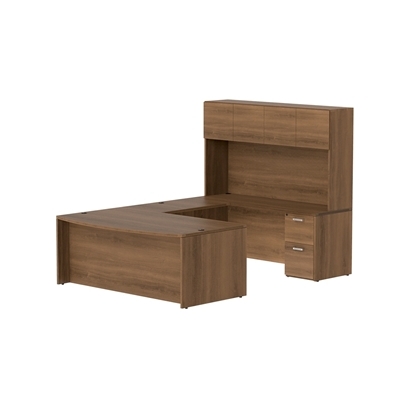 Perfect for an executive office or home where additional storage is needed. Free shipping on all discount office furniture. 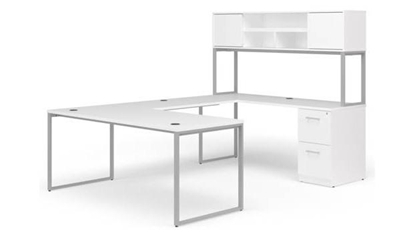 A contemporary styled U shaped desk with hutch, this unit from Offices to Go features a large work space area, full drawer file cabinets, and is constructed of durable 3mm PVC edge. The hutch provides added storage while freeing up valuable work space. An affordable eco friendly desk and great value. Free shipping on all discount office furniture. A great addition to any home office, private office, or commercial office, this U-Shaped Desk with Hutch offers plenty of storage space in a hutch with sliding doors, a file/file pedestal, and is available in 4 colors with a Nickel metal base to match any office décor. 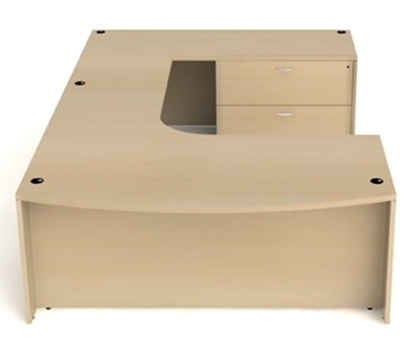 A versatile U-shaped desk that can be used in most office settings. This desk features a bow front design to provide extra work surface area, 1" thick commercial grade top, and is available in 5 different finishes. Great for use at home or at the office, this U-shaped desk works great in any setting. 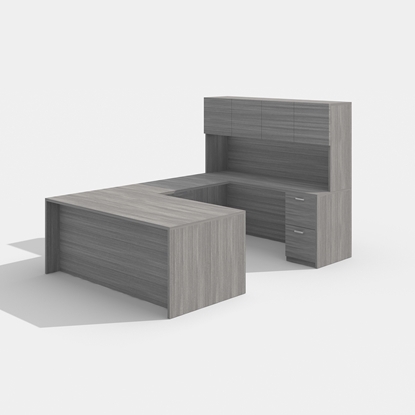 This desk features a storage credenza with a 1" work surface and is connected to a 1.5" thick commercial grade. A stylish U Shaped Desk with bow front from our Cherryman collection. The Amber features an oversized file cabinet with plenty of storage space. Includes a 1" thick top with profiled edge on all sides. Available in five stylish colors. Perfect for a business or large home office. Free shipping and warranty available on all office furniture. A great addition to any commercial office or home office, this U-Shaped desk features nickel legs, plenty of work surface area, and grommet cut outs on multiple components for wire management. This desk is available in 4 different colors allowing you style your work area in a multiple of ways. A desk that provides plenty of work surface area with a bow front that allows you to hold small meetings in your office. This U-Shaped Desk includes 1 box/box/file pedestal for you storage needs and a 1" thick thermally fused laminate work surface. 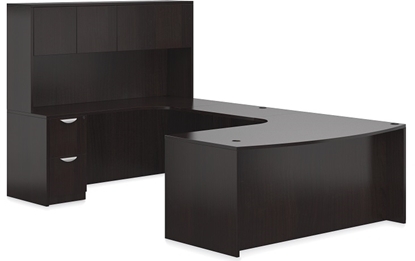 This Executive U Shaped Desk with hutch is the ultimate executive desk from Offices to Go™. Crafted from high quality laminate, it is as functional as it is beautiful. There is great storage and top capacity with rounded interior corners, and the hutch offers even more space. Eco friendly GreenGuard® certified. A great addition to any office or home office. This U-Shaped Desk is available in 4 different colors and features a File/File Pedestal and Hutch for all your storage needs. This desk combines modern design styling with a sturdy metal frame. 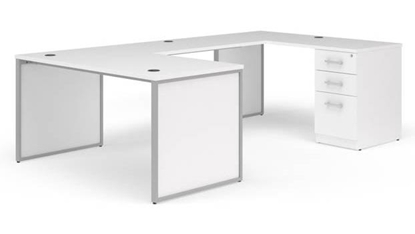 A modern stylish U-Shaped desk that is available in 4 colors to match any office décor. 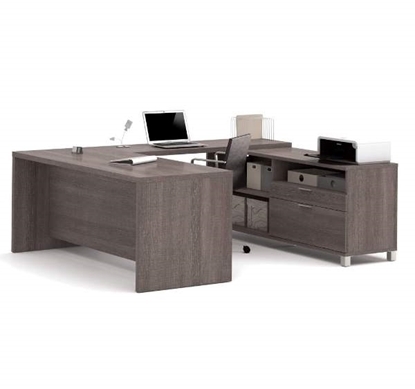 This U-Shaped Desk features a spacious 66"W work surface and has end panels to add style to this modern design. This unit would be great for either the home or the office. A desk designed with ample work surface area and modern detailing. This desk features a large 72"W design, nickel colors metal base, grommet cut outs for wire management, and a pedestal for all your storage needs. This desk is available in 4 colors and can work in home or commercial settings. A U-Shaped Desk with plenty of work space and storage space. This desk is available in 4 different finishes and features a bullet front, 3mm edge banding, and a hutch with doors. A great addition to any home office or commercial office. This U-Shaped Desk with Hutch offers plenty of storage, features a 1" thick commercial top, and is available in 5 color finishes to match any office décor.